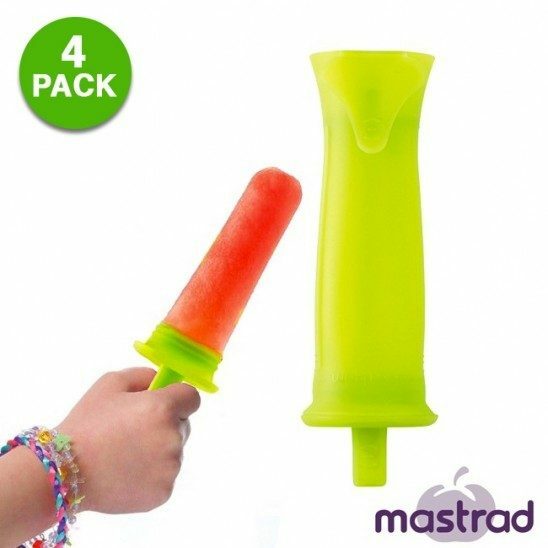 4-Piece Mastrad Silicone Ice-Pop Mold Set Only $7.99! Down From $24.99! Ships FREE! You are here: Home / Great Deals / 4-Piece Mastrad Silicone Ice-Pop Mold Set Only $7.99! Down From $24.99! Ships FREE! GearXS has this 4-Piece Mastrad Silicone Ice-Pop Mold Set on sale for $7.99 (Reg. $24.99)! The Mastrad silicone ice-pop mold is perfect for creating delicious desserts using any liquid your heart desires. This innovative designs allows you to eat your treats in two ways- eat them on their stick or as a push-pop. The silicone mold stands upright for easy filling. And no need to worry about making a mess thanks to the lip that collects any melted ice.